Corruption is one of the sicknesses of our society. PSI believes that one of the best alternatives to austerity and cuts to public spending is to seriously fight against corruption. We also link this new PSI campaign against corruption to the fight for global tax justice. A series of criminal trials over a bribery scandal over a P3 privatization scheme ended last week with people admitting that $22.5 million in bribes were paid, but with no one being convicted of actually paying them. For those naïve enough to believe that the justice system does a good job of policing the privatization industry, it was a very bad week. 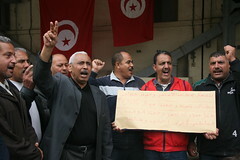 International Anti-corruption Day, 9 December - Who is protecting the workers who fight corruption? In view of increasingly more visible cases of corruption, dishonesty and fraud, the public is demanding an improvement in public governance through efficient and transparent public policies. Corruption is now perceived as a social illness that harms the common good that democratic states have the duty to defend. Extract from the Civil Society Report "Spotlight on Sustainable Development 2017" -the new global report assesses how privatization and corporate capture have become obstacles to progress under the 2030 Agenda. Global Spotlight Report says that the proposed “cascade” of private financing for infrastructure will result in more corruption, high fees for essential services, and massive resource transfers to the rich from the poor. Friday 23 June 2017 is World Whistleblowers’ Day. This day draws the world’s attention to the tremendous and fearless work of those who decide to denounce dishonest corporations and public officials, and who get fired, threatened, jailed or even killed in return. It also reminds us of the work ahead to ensure their protection. The impeachment of Park Geun-hye, now former President of South Korea, is not only the culmination of a political scandal involving corruption. It is also a victory built by the trade union movement which, relentless, denounced for years the abuses against workers committed by her regime. On International Anti-corruption Day, PSI is launching a new report: Checkmate to corruption: Making the case for a wide-ranging initiative on whistleblower protection – which contributes to the debate and provides arguments, evidence, and examples on how a robust protection for whistleblowers with the active support of trade unions is a major – if not the most important – tool to fight corruption. Spotlight Report: "Reclaiming Policies for the Public"
Report by the Civil Society Reflection Group on the 2030 Agenda for Sustainable Development. This policy brief on Anti-Corruption was produced for the PSI Executive Board EB-148 held at the ILO in Geneva (Switzerland) on 19-20 May 2016. Its objective is to inform EB-148 of recent activities on anti-corruption and to inform EB-148 of proposed action on the protection of whistleblowers for 2016. The brief is available in English, French, Spanish, German, Swedish and Japanese. On 16 September 2015, Public Services International and UNI Global Union held a strategy meeting at the International Labour Organisation in Geneva to build co-operation between the global union federations to fight corruption and secure whistleblower protection at work. This research paper published by Oxfam International shows that the richest 1 percent have seen their share of global wealth increase from 44 percent in 2009 to 48 percent in 2014 and at this rate will be more than 50 percent in 2016. PSI Steering Committee (SC-18) met in Geneva on 12-13 November 2014. The agenda covered all items relating to the implementation of the Programme of Action with a special focus on the global campaigns PSI is leading on trade agreements and tax justice. The provision of quality public services is a right for all. Ensuring that these services are adequately funded and free from corruption is essential to their provision. The public often perceives corruption in public services above all as a phenomenon of individual public service employees taking bribes for delivering services or favours to individual citizens. Many citizens of the wealthy and more developed nations believe that corruption is particularly a problem of politicians in poor or developing countries. However, these are only some aspects of corruption, and focussing on them alone obscures the fundamental problem of corruption as a challenge for societies all around the world. Presentations by Jürgen Buxbaum, Coordinator Public Administration and Multinational Enterprises on PSI's anti-corruption campaign. The 2012 PSI World Congress provided a framework for Public Services International's discussions and decisions. However, it is necessary to focus priorities. This document presents a detailed implementation plan for PSI's mandate in 2013 and beyond. Corruption is a poison that destroys people’s faith in public institutions, governments, and democracy itself. Following the successful PSI Symposium on the Protection of Whistleblowers, held in Geneva on 30 October 2017, PSI is organising a Whistleblowers’ Task Force that will take place in Buenos Aires (Argentina), on 7 December 2017. The Forum, which was held in Bogota, Colombia, on 9 December 2014, was attended by representatives of Colombian government agencies and public service unions from Chile, Colombia, Mexico and Peru, who shared their experiences of fighting corruption and promoting transparency in public services. Around 300 civil servants and officials from different Colombian public control and auditing bodies are expected to for this conference on the fight against corruption in public administration. PSI’s Asia Pacific Regional Office is hosting a forum on quality public services on 16-18 October 2013 in Bangkok, Thailand. The forum will highlight discussion on the priority public services issues of the region, evaluating union strengths and strategies to take the issues to a further level. A PSI parallel event on public finance control and anti-corruption strategies. Public Services International (PSI), the European Federation of Public Service Unions (EPSU), together with our affiliate unions, ADEDY, and allies in Greece brought together a team of expert union journalists and communicators. This solidarity exchange enabled PSI communicators from other countries to learn more about the issues facing Greek trade unionists and share this understanding with their union members and communities around the world. 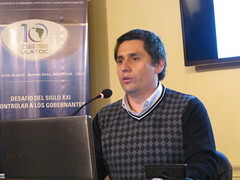 More than 100 members of affiliate unions of Public Services International (PSI) came together from across the Americas for a Tax Justice and Anti-Corruption Forum in Buenos Aires, Argentina in late April 2014. Watch this inspiring two minute video interview about the need for a tax justice campaign in Ghana, with Bernard Adjei, Deputy General Secretary, Public Service Workers Union (PSWU TUC). Audio: Money lost through corruption could fund decent public services. Every year about $2.6 trillion is stolen by corruption. This money could be used to fund decent public services and help developing countries. 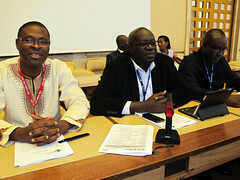 Public Services International hosted this forum as an official side event of the International Labour Conference in Geneva, Switzerland. Participants discussed how corruption undermines public services and democracy. Corruption wastes public money by diverting it into the hands of corrupt politicians, businesses and their agents. Ending corruption requires public and political organising to demand that political leaders represent public interests, not the interests of rich individuals and powerful companies, and to hold them accountable.